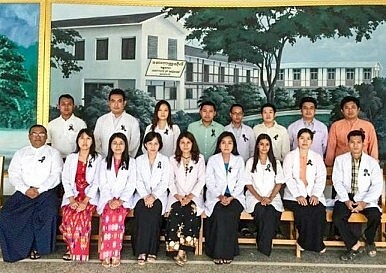 Doctors at the University of Medicine, Mandalay, August 16, 2015. The doctors pictured are all graduates of that university and most of them are working in hospitals as consultant surgeons and assistant surgeons under the Ministry of Health, Myanmar. They are wearing the black ribbons to show their unity and take part in the Black Ribbon Movement. 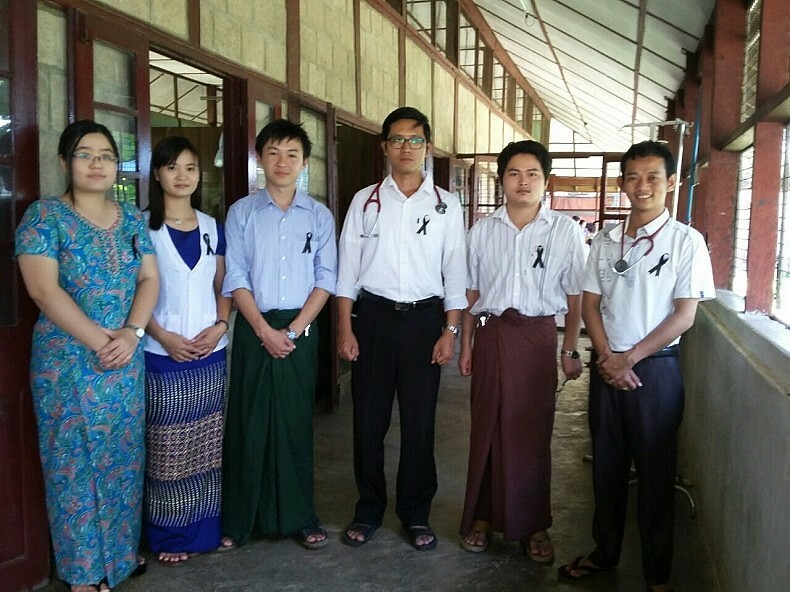 The Black Ribbon Movement 2015 is representative of the need for change in Myanmar’s healthcare administration. It was in the middle of the night on August 10, 2015 when I first saw lots of notifications on my Facebook page alerting me to an online campaign protest by Burmese medical doctors. The campaign was titled “Black Ribbon Movement 2015.” I was already enrolled as a member of the campaign’s private Facebook group and recognized a photo of familiar orthopedic surgeons wearing black ribbons on their green OT coats. The sudden appearance of this campaign led by fellow doctors was quite exciting and surprising. Even four years after Myanmar took its first steps toward democracy, there remains a lingering narrative of authoritarianism following decades of military rule. Forums of broad public protest, like the Black Ribbon Movement 2015, are relatively unusual in Myanmar. Even the activities of political activists have been guarded, restrained and cautious in the context of the country’s upcoming general election, set for November 8. Yet, the voices of civil society actors—from doctors to educators—are vitally needed to support Myanmar’s ongoing path toward democratization. So when I saw the campaign, my interest was immediately piqued and I contacted members of the campaign. They said the campaign was a protest against the appointments of military officers to administrative positions—the equivalent of a captain or major taking a deputy director position in the Ministry of Health. Though not new, these kinds of appointments are usually disapproved by the public and interpreted as the military’s colonization of the civic domain. Most civil organizations in Myanmar are under management of military-derived officers. A group of assistant surgeons at the Pyin Oo Lwin 300 Bedded General Hospital show their unity with the Black Ribbon Movement. The Black Ribbon Movement 2015 is one of the very first public movements against the militarization of a civil organization in Myanmar. Almost overnight, the campaign’s Facebook page solicited thousands of members and generated media attention. Many doctors in various hospitals all over Myanmar started to wear the black ribbons with the slogan “Say No to the Militarization of Myanmar’s Ministry of Health.” Photos of the doctors wearing black ribbons were constantly posted online. Other professionals such as engineers and lawyers also started to participate and posted their photos on the page as well. The solidarity and terrific unity shown by healthcare workers created a driving force, which seemingly prompted an announcement made by the minister for health, who himself is a former general. The minister told the media that there would be no additional appointments of military persons at the MOH, but that there would be nothing done about military officers who were already assigned to the ministry. The campaigners are still not fully satisfied with his response and promised to continue the campaign until two goals are reached: an official written statement is issued and those newly-assigned military persons return to their original positions. Some doctors even wrote on the Facebook page that the minister himself should step down. Why this particular incident sparked such an outrage is worth investigating since this is just the tip of the iceberg. There are deeper frustrations among health workers in the country. Job satisfaction among doctors and nurses is unsatisfactory due to unpleasant working conditions, shockingly low salaries (around $250 per month), and highly centralized administration. Burmese doctors often face overwhelming workloads and limited resources. If we take a wider view, all of these problems are derived from a weak health system that was long kept under neglect. According to the World Health Organization, Myanmar’s health system was ranked the second worst in the world in terms of health system performance in 2010. Until 2011, the government spent very little on health compared to other Southeast Asian countries. Myanmar still lacks a social security system — even the minister for health himself may not have any health insurance. The out-of-pocket health expenditure in Myanmar is the highest among Southeast Asian countries, and a large number of the population is kept in poverty due to catastrophically high health expenditures. Shortage of doctors, nurses, medical assistants and midwives has steadily worsened over the years. Infant mortality and mortality of children under the age of five years are quite high especially in rural and conflict-affected areas. High transmissions of communicable diseases such as HIV, tuberculosis (TB) and malaria as well as the appearance of drug resistant strains of TB and malaria in the border areas of Myanmar are critical concerns. Non-communicable diseases such as diabetes, hypertension, and heart disease are also prevalent and account for the nearly half of total mortality in the country. In addition, Myanmar is currently facing some of the worst flooding it has seen in its recent history, affecting 12 out of 14 states. Thousands of people are now in need of humanitarian aid, and the government’s attempts to provide such aid have been slow and mismanaged. Some would think the situation couldn’t possibly get any worse, but it still can if the government continues to supply poor leadership. Since the most recent reforms were implemented, several important health policies have been made and steps toward building a system of universal health coverage have been taken. Priorities have been defined and a national health plan was developed. However, adequate planning, oversight, transparency, and credibility in management are still lacking. The government’s micromanagement and its underutilization of relevant specialists in the field have led to immediate and long-term problems alike. What the MOH really needs are competent technocrats, specifically with health-related expertise. There is a need for health economists and health policy and public health specialists, not military officials. If there are no such specialists in the country, then Myanmar must make a push to provide such training. There are many jobless young doctors who are qualified and seeking appointments at the MOH. Appointing military officers—especially those without relevant knowledge—to management positions at the MOH is outrageous. Though the military can be admired for its disciplined culture, it is still very chain-of-command-based and leaves no room for innovation. This culture directly clashes with civil organizations like the MOH, where new thinking, individual empowerment, collaboration, and creativity are essential to productivity and prosperity. 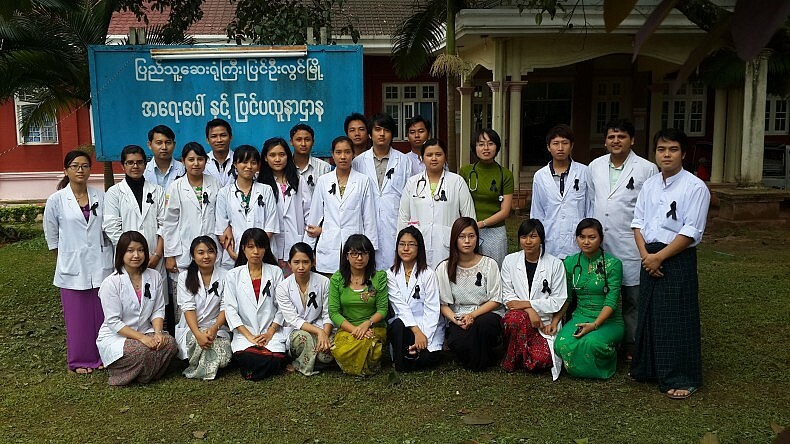 The Black Ribbon Movement 2015 is representative of the need for change in Myanmar’s healthcare administration, and a sign of the reemergence of a proactive civil society. The movement illustrates why the military’s approach to management is unacceptable in the MOH, and more broadly, in many civic organizations. The movement also provides a salient example of how social media can be used to highlight voices in civil society in a way never thought possible in Myanmar. Although the broader political climate in Myanmar may not be significantly changed by the Black Ribbon Movement 2015, we can be sure that it will remain one of the first social movements to effectively use social media against the militarization of civic organizations and garner a response from the government. Phyu Phyu Thin Zaw is a visiting scholar in the Asia Health Policy Program at Stanford University’s Walter H. Shorenstein Asia-Pacific Research Center. Her research areas are current trends in Myanmar’s health policy, reproductive health, equity and gender issues.